Look, it makes sense. If even just 5 to 10% of your clientele is coming to your business by X, you'll want to make their arrival as easy and welcoming as possible so that they keep coming to your establishment. In this case, X happens to be "bicycle." Portland businesses are catching on that parking for customers that arrive by bicycle is an important feature for retaining and increasing their customer base. Often, PBOT can help you meet some or even most of your customer parking needs by installing free racks in the public right-of-way. Sometimes businesses, such as Hopworks Urban Brewery, really want to go above and beyond to ensure that people bicycling are catered to. Others, like the Alibi in North Portland are ensuring that all of their customers have access to a parking spot. As I rode by today, I snapped a couple of pictures of Alibi's new bicycle parking. They installed this rack themselves in their parking lot. I suspect we'll see more businesses start to follow suit. 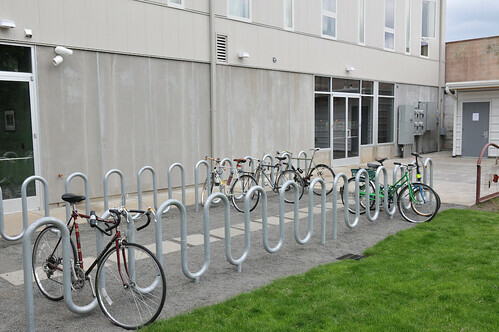 If your business, or a business you frequent, would like a free bicycle rack installed in the planting strip between the sidewalk and the street (must have concrete in place) contact us. Check out our other articles on businesses stepping up their parking with creative and bike-friendly solutions.